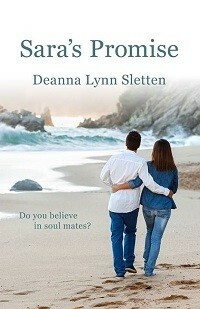 The cover of Sara's Promise captivated me. After reading the description, I was equally captivated by the story so I bought it and was not disappointed. This was my first experience reading a title written by Deanna Lynn Sletten and I know it won't be the last. Sletten created a compelling cast of characters I feel honored to have known, even for the few hours I spent in their presence. I'll remember them and thank the author for sharing them. Sara's Promise, at its core, is about undying love which transcends time, space and circumstance, even physical death. Sara was a woman who devoted her life to her family, having set aside her professional desires to raise her children. However, tragedy would strike changing everything in a matter of hours. Sara was taken from her family and we see her as she begins her eternal journey filled with peace until she looks below and sees her grieving family. Turmoil sets in. Determined to find a way to take care of her family, as she promised her husband she would do should the unexpected ever happen, her wish was granted in a way the average reader would never expect. I was fascinated by this journey and wondered how it would end. I thought about the family Sara had left behind - a wayward daughter, a workaholic husband and a model son any mother would be proud to call her own. Watching the story unfold was an experience I feel privileged to have enjoyed and I'd recommend it to anyone who likes a wholesome story with a message. In the end, love does conquer all. The clock keeps ticking and life goes on. Healing takes place and transforms even the worst of us as long as we are open to receive the blessings God has in store. If you are interested in reading the story or would like to even take a look at some of the wonderful reviews this book has received, please click the book cover to be taken to its page on Amazon.